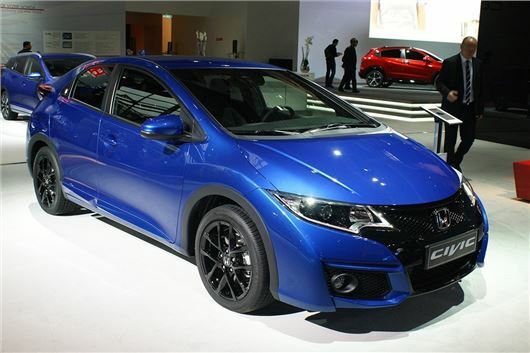 Honda has revised the Civic, with styling tweaks and new technology. Additionally a Sport trim level has been added to the range. The changes across all of the Civic line up, in both Tourer and hatchback bodystyles, include redesigned headlights with daytime running lights, redesigned bumpers, new side skirts and a black rear spoiler. The updated Civic also gets new infotainment, with DAB and internet radio, Bluetooth, web browsing, navigation and a reversing camera. City Brake Active, which is designed to mitigate or prevent low-speed accidents, is now standard too. Honda has also added a new trim level to the range, called Sport. Based on the hatchback it features unique 17-inch alloy wheels, plus styling that reflects that of the upcoming Type R model, due in 2015. Power comes from either a 120PS diesel or a 142PS 1.8-litre petrol.